Please note that Strawberry Chapel is located on private property. It is not open to the public except during its four annual services, held each October, November, March, and April. No valuables are ever kept onsite in the chapel. Strawberry Chapel is the only remaining structure from the 1707 Childsbury settlement. 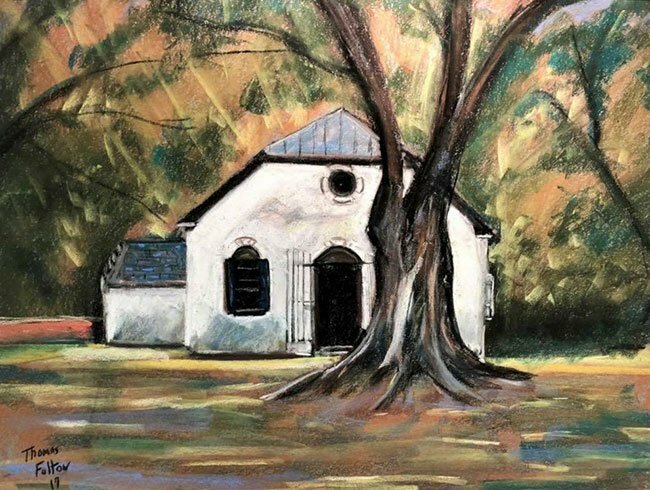 The church was built as a chapel of ease in 1725 as part of the St. John’s Berkeley Parish and is located in Berkeley County at Cordesville. Its establishment was a mission church to the main parish church at Biggin Church and its early minister was a French Huguenot. Childsbury was one of the first towns to be laid out by Englishmen arriving in the Carolina colony. It was named after founder James Child, who established a Cooper River ferry and helped design the settlement. Child also donated 600 acres of land for inhabitants to use for farming. The ferry, known as Strawberry Ferry, served residents of the area as a direct route to Charleston as rivers were the main mode of transport in those times. 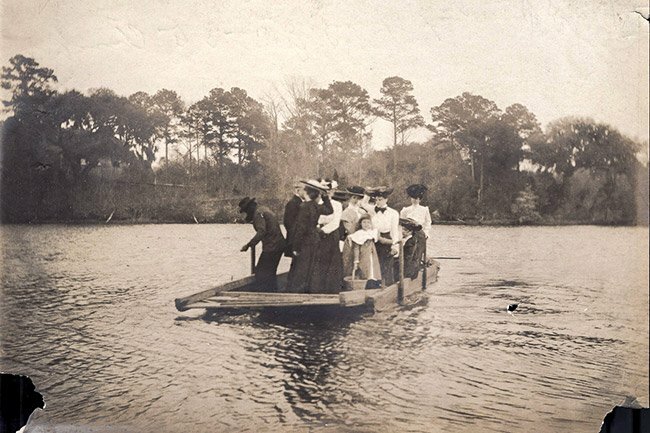 Strawberry Ferry operated between the location near the chapel, at the bottom of the bluff and about 100 yards from the modern dock there today on the Cooper River. 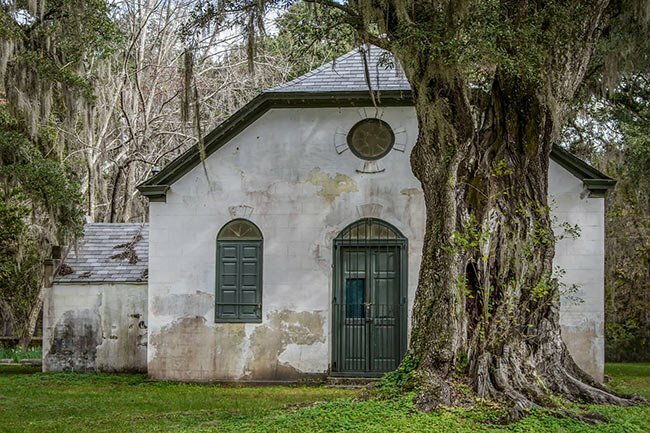 It went across the river to the Bluff Plantation, near Cypress Gardens, where a road would take travelers to the Broad Path which is modern day Highway 52 providing a direct route into Charleston. This was an important mode of transportation for residents traveling to and from the area for business and pleasure. 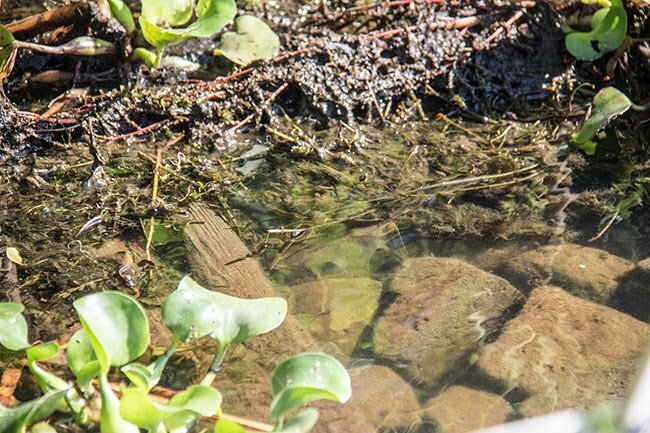 The photo below shows remnants of the ferry landing, on the chapel side, showing wooden pilings and scattered bricks. 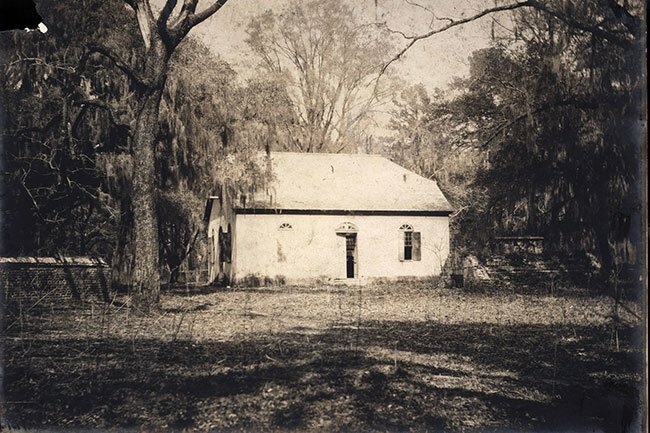 Due to the rapid prosperity of other Lowcountry plantations, farmers from Childsbury had a hard time competing, and the town did not last. Eventually the settlement’s buildings were absorbed into nearby Strawberry Plantation (from whence the chapel gets its unusual name). 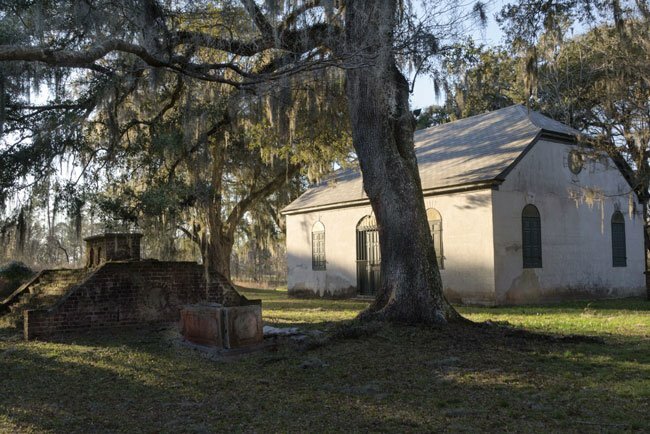 Part of the original Childsbury plan, Strawberry Chapel was built to make it easier for the villagers to attend worship without traveling to the parish church – Biggin Church – which was 10 miles away in Moncks Corner. This chapel of ease was unusual in that the sacrament of baptism and funeral services, usually reserved for full parish churches, were regularly performed here. The Harleston Family vault (seen below) was a receiving tomb for the chapel. Deceased bodies were stored here while their plots were prepared for burial. The interior of the vault has a barrel (domed) ceiling made completely of brick with dirt floor and is partially underground providing a cool environment for the bodies to wait. Strawberry Chapel is completely rectangular in plan with an anteroom on the rear of the church that was used for the minister to change clothes and prepare for services. The ceiling is domed and the floor paved in stone. An entrance door exists on three of the four interior walls which align with each other, as well as the windows, to ensure proper ventilation for the hot and humid days in the Lowcountry. 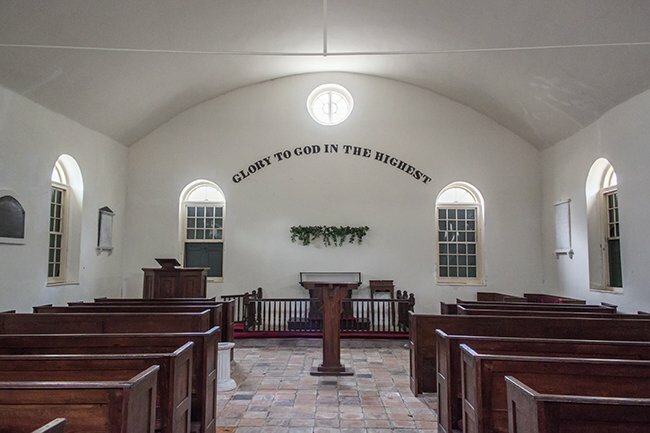 On the rear wall, under a circular window above the pulpit, the words “Glory to God in the Highest” are written on the wall, each letter was made using hundreds of miniature pine cones. Four times a year services are held in this historical setting. 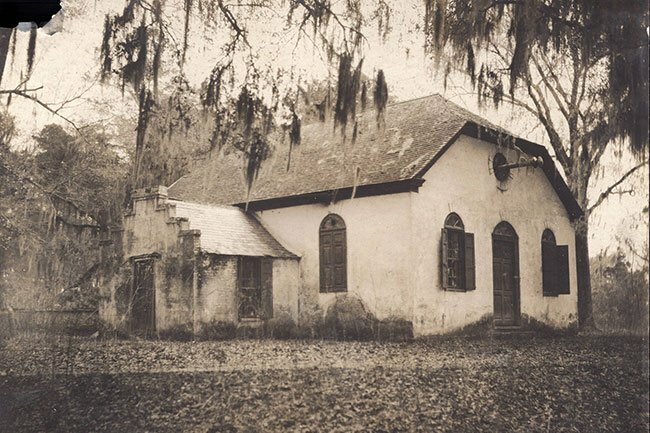 The silver once used in services was unearthed from beneath the rice mill at Comingtee Plantation in 1946. 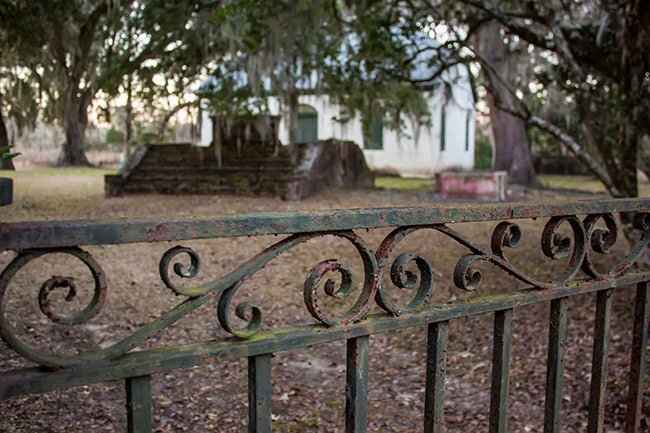 Owner Keating Simons Ball buried the church silver used in parish services in 1865 when Union troops ravaged the towns of South Carolina at the end of the Civil War. It is said he could not remember where he buried it once the war was over. The mahogany trunk bearing the silver was rediscovered by Comingtee manager Grover and Martha Sullivan some 81 years later. 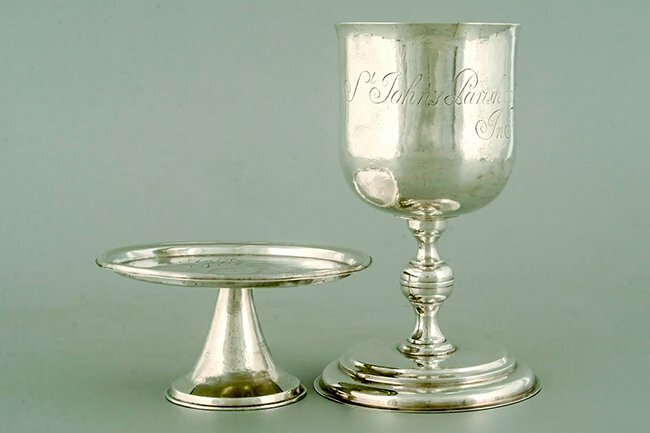 Strawberry Chapel’s Paten & Chalice are two of four of the oldest pieces of Southern silver to survive. These were made by Miles Brewton in 1705 and are on permanent loan to the Charleston Museum. The silver is never housed in the chapel. The following information comes from a story which was first published in “The Youth’s Companion” in October 4, 1894 and later republished as a standalone book titled “Little Mistress Chicken: A Veritable Happening of Colonial Carolina” by Mrs. Arthur Gordon Rose. Catherine Chicken, great-granddaughter of James Child, is said to have suffered grave abuse in the chapel’s churchyard as a young child in 1748. At seven years of age, Catherine was sent to board with her French schoolmaster, Monsieur Dutarque. Catherine was in trouble for not completing her chores when the schoolmaster found her outside chasing her pet turtle around. When he asked her why she had not completed her chores, she told him she just wanted to be outdoors. Dutarque was enraged and thought he would punish his student by tying her to a tombstone and leaving her there for a brief period of time. If she wanted to be outdoors he would ensure she stayed outdoors. He only intended for this to last a short period of time but forgot and left her there into the night. According to the story, Catherine kept whimpering and crying out that she would be good and to please let her loose. A slave was walking in the night with a Jack-o-Lantern gourd fashioned as a torch illuminating his way. He heard the cries and went into the graveyard to investigate, as he neared little Catherine she became so frightened from the gourd headed towards her in the night that she passed out. Afraid for his own safety, the slave retreated behind a nearby tree hiding as he heard men approaching the churchyard on horseback. The cries had been heard by other workers in the schoolhouse and they came to set her free. Dutarque was run out of Childsbury for his action but his legacy of barbarism continued at the Walnut School for Boys in Camden. Many erroneous accounts exist that Catherine died that night, she did in fact survive though not completely unscathed. Her portrait shows a slight downward curve in her smile which many believe was the result of a possible stroke from the ordeal. Catherine went to marry Benjamin Simons III of Middleburg Plantation where she lived a full life raising her children. Catherine is buried in the churchyard of Pompion Hill Chapel which neighbors Middleburg. Childsbury, one of the early towns to be laid out in South Carolina (1707), is significant as an important archaeological site. Englishman James Child started a ferry here as it was the only practical ferry site across the Cooper River within a reasonable distance. Property was designated for a college, a free school, a house for the schoolmaster, a place of worship, and a market square. To the inhabitants of Childsbury, Child gave 600 acres to farm and pasture. He also gave them the 100-acre hill by the river to build upon as a citadel to protect the town in times of war. Due mainly to the rise of the new and growing plantations, Childsbury began a rapid decline and the town site eventually became part of a plantation. Strawberry Chapel is the only visible remains of the town of Childsbury. Architecturally the chapel displays the simple, yet dignified and impressive lifestyle of an Episcopalian Chapel of Ease. This one story rectangular brick building has an unadorned hipped gable roof. The double three paneled door of the façade, surmounted by flush fanlight is symmetrically situated between two shuttered windows of the same three panel design. These chapels were built to serve the people for whom the regular parish church was inaccessible. Strawberry Chapel became unique as a Chapel of Ease in that it is operated as a full parish church. Usually these chapels were denied some of the privileges of a parish church. A small cemetery is adjacent to the chapel. 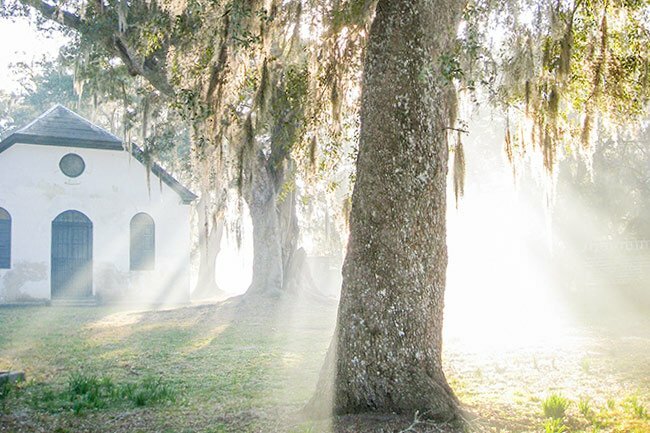 While the chapel at Strawberry served as an Episcopal church for many years, it is now an independent entity. This historic view of the chapel shows the elevation visitors would see from the road and gate area. To the left of the chapel, behind a brick wall is the Ball Family enclosure. To the right in front is the Harleston Family vault. This view is the rear of the chapel and shows the stepped gable of the anteroom where ministers would prepare for services. The pipe that leads from the circular window above the side entrance was from the stove used for heating during the cooler months. 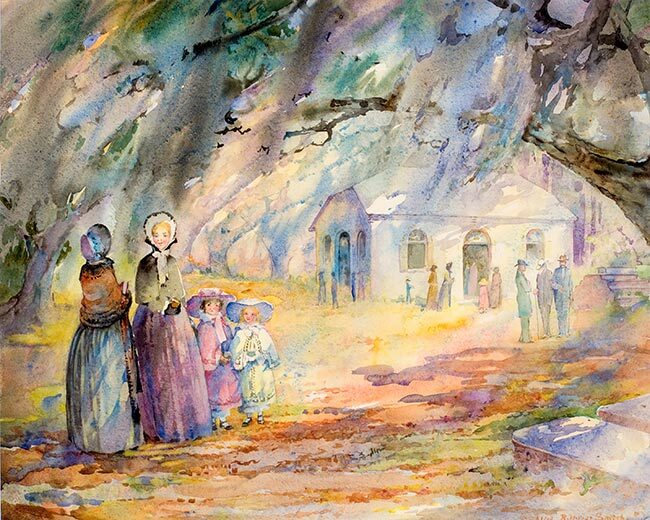 The painting below shows Parish Church from the series A Carolina Rice Plantation of the Fifties, ca. 1935, by Alice Ravenel Huger Smith (American, 1876 – 1958). Strawberry Chapel’s 2019 Senior Warden is Dr Robert Ball. Tom Stoney hasn’t served on the vestry for a number of years, but his dedication while serving will always be appreciated. Strawberry Chapel has a communion service Sunday, March 17, 2019 at 12 o’clock noon. Picnic follows on grounds around chapel. Everyone should bring one dish to share at picnic. Bring your own beverages, chairs, plates, utensils, etc. The Strawberry Chapel fb page does not have members. It is a means for posting information and Chapel history. Vestry members unfortunately aren’t available to open and close grounds for individuals seeking access to property. Most work full time. You are welcome to attend a scheduled service or volunteer to help on work days. Thank you for your interest. Would love to be able to view the cemetery with a group this Saturday. Can you give us permission to do that? The 2019 service schedule for Strawberry Chapel is now set. The dates are all Sundays, the time all at noon, on March 17th, April 28th, October 6th, and November 10th. Typically, we always have a picnic afterward, so please join us and bring a dish to share along with a chair or blanket to sit on. Please send your email address to the vestry’s Senior Warden so annual service calendar can be sent to you. Men traditionally wear a sport coat and tie but it’s not manatory. Ladies wear slacks, skirts or a dress but depends on weather. Building is generally cool. 2019 dates are mentioned in various comments. 2019 schedule posted today but reposting in case you didn’t see info. This fb page does not have members. It is a means for posting information and history by vestry. You may join the Friends of Strawberry Chapel but remember to answer the questions fully. Time of Service, Appropriate dress, need to bring one’s own Prayer Book/Hymnals, etc. We are so excited to attend, one or both, as well as to assist in care. The story you mention is unrelated to Strawberry Chapel’s history. Hello Jasmine, we have researched the chapel extensively and have never come across any such story. There are many inconsistent stories and rumors about Strawberry Chapel, but we wouldn’t put much weight into the majority of them. This one doesn’t sound like it is based on facts, other than that white owners would have owned slaves at the time of Strawberry Chapel’s construction. The information in our article above comprises as an overview of the chapel based upon historic documents. Weddings can take place on private property as long as the owner/caretaker approves them. Strawberry Chapel is still used for church services four times per year. Is it true from the stories that I heard as a child that when they built the Strawberry Chapel, the “white” owner had slaves to work for him, and one day something happened between the owner and slave, that he put all of his slaves in a building than locked it where they couldn’t escape, and he set it on fire for them to burn? I just wanted to ask this question because if the place is “Private Property” then why was their weddings happening there? Also to I am from South Carolina and I just need the correct information about this question that I had for a few years now. What will the schedule be for 2019, do you know yet? Please feel free to join us for services, and I must remind all due to comments on this site that the chapel property is fenced and gated due to continuous trespassing and occasional vandalism. Violators are prosecuted to maintain the best security for the chapel and gravesite. and perhaps some plates, utensils, drinks, and chairs or blankets to sit on. The Chapel is not heated and tends to be cool inside. There isn’t a Christmas service. The months of March, April, October, and November each have one annual service. Question: Is there a Christmas service and if so, when? Thank you! Took pictures of the chapel and the Sullivan homestead last week. It's every bit as beautiful today as when built. Am seeing the Communion silver this am at the Charleston Museum. My great-great-grandfather, William Harleston, is buried at the cemetery adjacent to Strawberry Chapel. I would like to visit in November. Please tell me specifically how to contact the vestry. Thank you. How do I get in touch with someone who can let me take tombstone pictures for http://www.findagrave.com? I am a genealogist and also the 8th great granddaughter of the founder of Childsbury, James Child. You can contact Strawberry Chapel’s vestry regarding your inquiry. We’ve photographed there with permission. A vestry member simply mentioned photographs taken at/of/in Strawberry, from any angle, within property lines should never be sold for profit and informed us vestry considers photographs taken can be copied or used by vestry. We gladly provided our quality shots. I’m hopeful anyone visiting historic sites will make a little donation to each place they visit. We will never forget our experience and fellowship shared. There is much found on line regarding Strawberry’s history but do not believe in ghost encounters. Every graveyard is unnerving and creepy at night which makes one’s mind imagine what isn’t there. 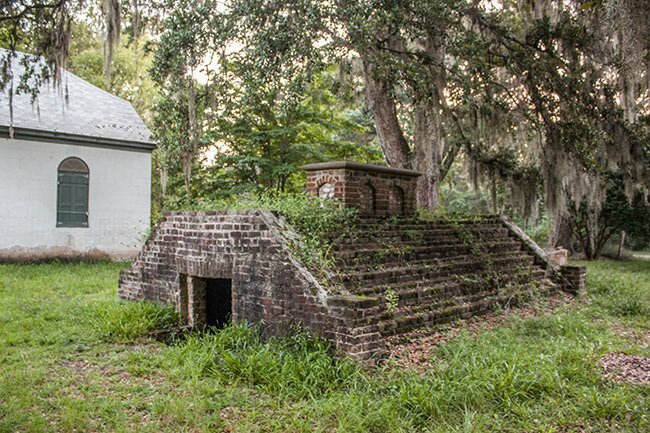 We’ve never seen a ghost there or anywhere in the Lowcountry we love, and we’ve lived and spent time in OLD houses with fascinating stories. The open tomb was never a burial tomb. It is a “cooling” vault used before burial. 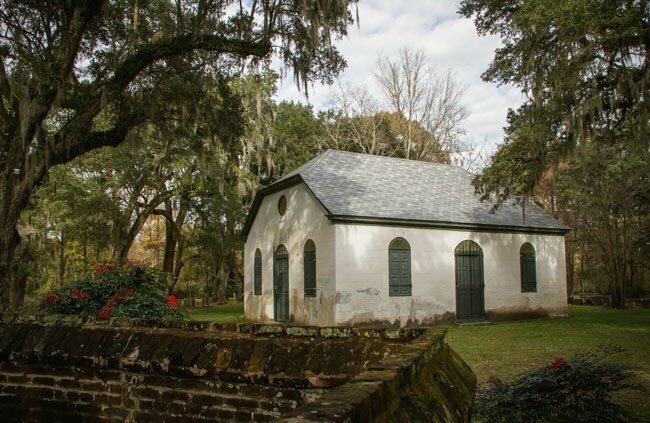 Strawberry Chapel is separate property from the State of SC-owned Childsbury Heritage Preserve property. Strawberry receives NO state or county funding. It is the sweat and private resources of dedicated individuals that continue to maintain, preserve and protect Strawberry from stupid vandals and spirit seekers. We are glad to share of services and story with those respecting history and honoring our past and present. Joey and Dana – it’s unfortunate, but due to continual problems, law enforcement has the right to ticket or arrest anyone entering private property at anytime. Much appreciation to those like Brandon who treasure our Chapel’s beauty and respect our past, as well as our present. I was there 1-25-15 around 11:00 pm by myself and was going to lie in a grave and go to sleep. I wouldn’t suggest to go there during the night. We have seen something that we can’t explain. We don’t go there to mess with anything; we usually stand outside the gate and look. I like to go there because I find it interesting. But we took pictures and we came out with some unexplainable stuff. It is privately owned and surrounded by a fence. Is it available for a very small wedding ceremony? Just wondering if I could go and see the place. How do I go about seeing it? I hear a lot about the place. I do believe any graveyard visited in dark of night is scary and creepy. Each of us can help protect Strawberry Chapel and other sacred places by promoting history verses peaking curiosity of spirit seekers. Donations to Strawberry Chapel are tax-exempt since it qualifies as a 501(c)3 organization. Due to recent ice storms, tree and debris cleanup is necessary. I am truly interested in the history of this chapel, not to mention the legend. What are services people are talking about? Can I actually go there? Updates on Strawberry Chapel can be found on Facebook. 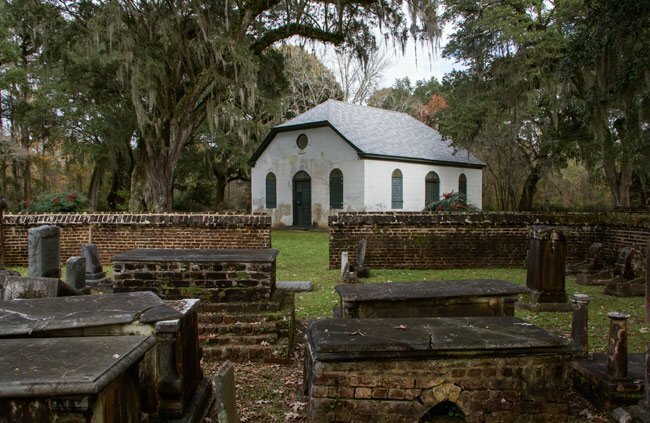 St. John’s Berkeley parish consists of Strawberry Chapel and Biggin Church ruins. The chapel is in great need of costly restoration due to vandalism, so donations are appreciated. Strawberry Chapel is a chapel-of-ease and was/is associated with Biggin Church (now in ruins) under the name St John’s at Berkeley. I think it’s horrible that people have to be so immature to go through and ruin everything for everyone. People that are truly interested and want to go to Strawberry Chapel to see what’s there, and can’t because stupid immature people want to destroy things that don’t belong to them, not to mention disrespecting the dead. So sad. It is sad that people have vandalized the chapel and graves, this is a place I have visited on many nights. Josh is correct, it is for sure haunted. There is an open empty tomb in the cemetery in which myself and friends have heard voices. That place is definitely haunted at night – did not believe it at first, but soon found out it was! Please note: St John’s at Berkeley (Strawberry Chapel) is private property and should be viewed only from afar unless permission has been granted to enter the grounds. Unfortunately, graves and chapel have been violated by destructive individuals. Hi! Do you know if it is possible to see the chapel or is it off limits except for the services? And how can I get information about the services (times & dates, etc)? Thank you for letting us know, Beth! Why was it called “Strawberry” Chapel?